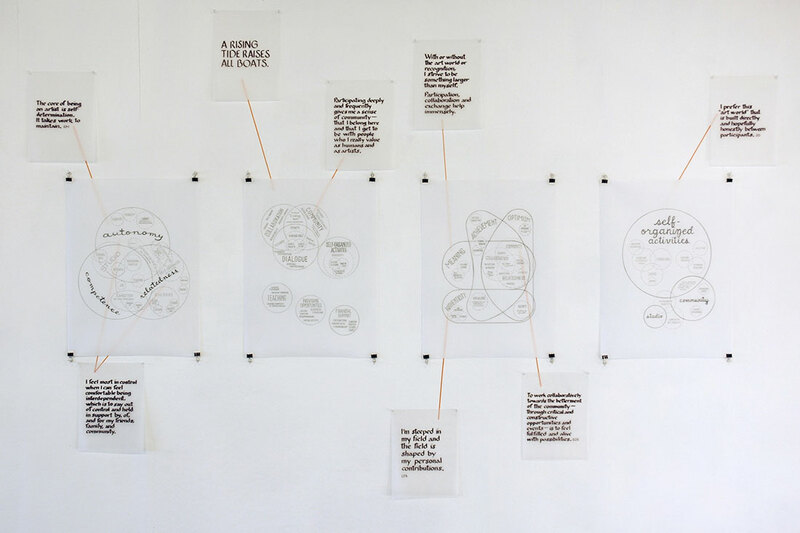 Inter/dependence with diagrammatic drawings, quotes, and a flag, 2015, mixed media, dimensions variable. 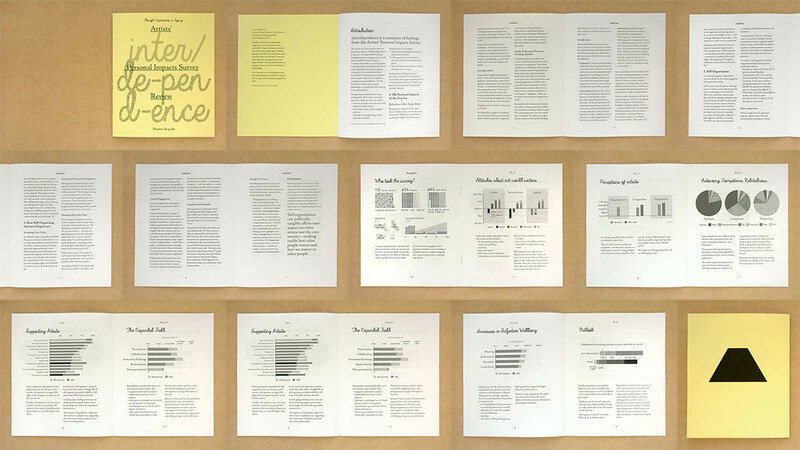 Inter/dependence, 2015, 20-page ’zine, 8.5 x 7 inches, first printing, 100 copies. 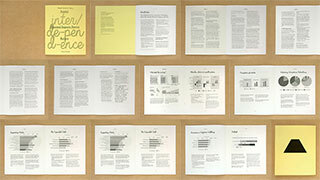 Detail of Inter/dependence: pages 10–11. 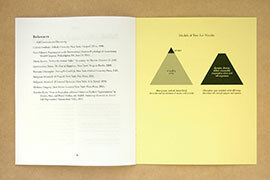 Detail of Inter/dependence: page 16 and inside back cover. 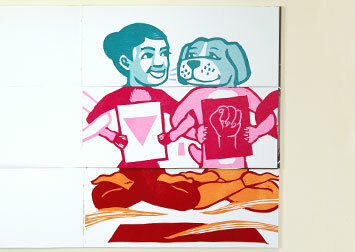 Thumbnails of all 20 pages of Inter/dependence. Order a hardcopy below or download the PDF. 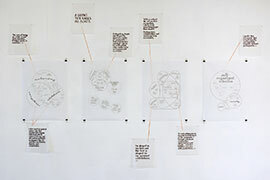 Studio view: Venn diagram drawings and calligraphic responses, 2015, graphite and ink on vellum with tape, 24 × 18 inches / 61 × 45.7 cm and 12 × 9 inches / 30.5 × 22.8 cm each. 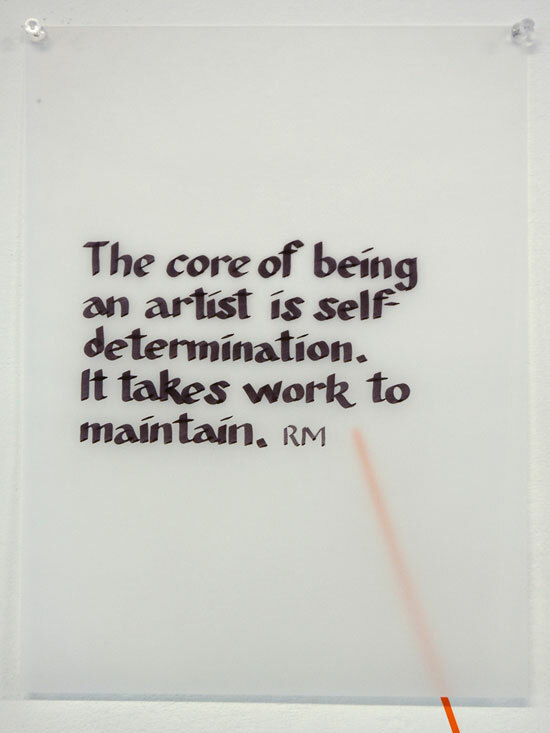 Quote A: Self-determination, 2015, ink on vellum, 12 × 9 inches / 30.5 × 22.8 cm. 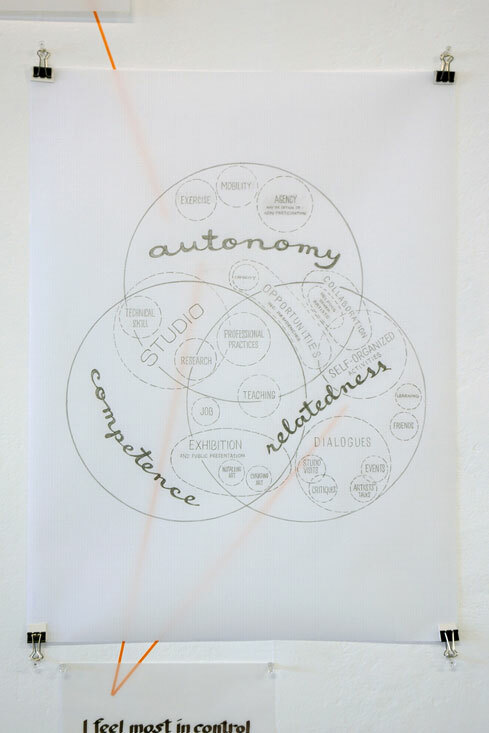 Ranu Mukerjee’s response to question 18 on autonomy. 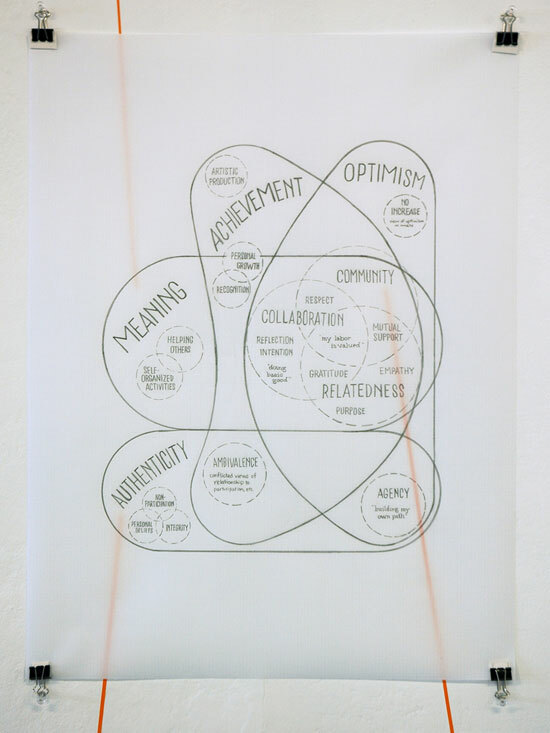 Quote B: Interdependent, 2015, ink on vellum, 12 × 9 inches / 30.5 × 22.8 cm. An anonymous response to question 18 on autonomy. 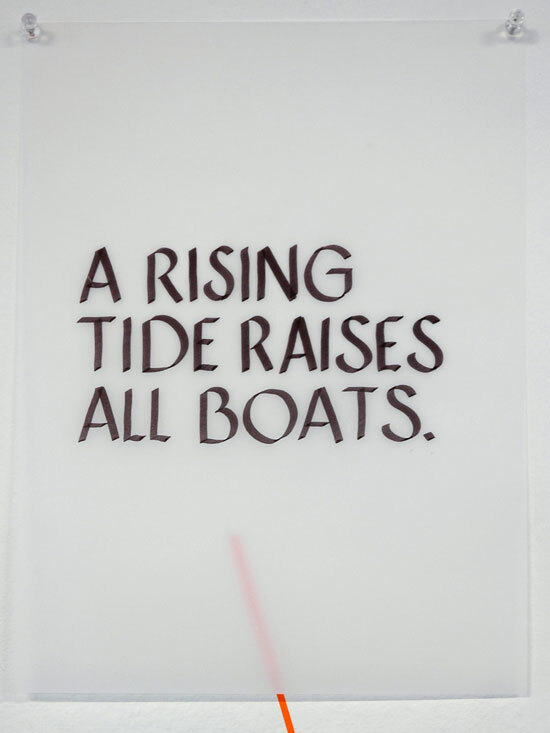 Quote C: Rising Tide, 2015, ink on vellum, 12 × 9 inches / 30.5 × 22.8 cm. Aphorism shared by Michelle Wilson in response to question 25 on the most personally rewarding aspects of supporting other artists. 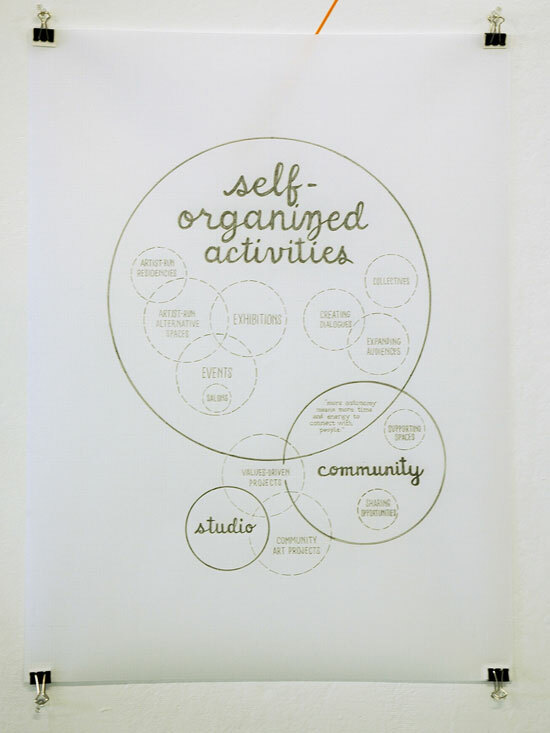 Quote D: Participating deeply and frequently, 2015, ink on vellum, 12 × 9 inches / 30.5 × 22.8 cm. Anonymous response to question 25 on the most personally rewarding aspects of supporting other artists. 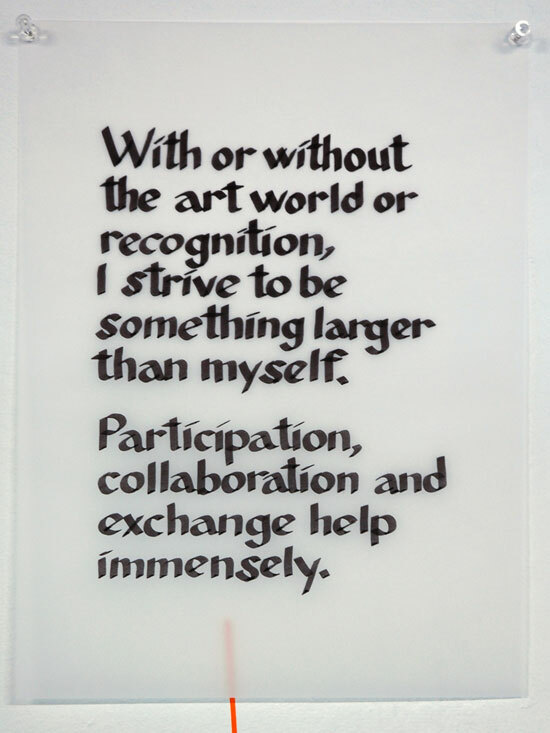 Quote E: Larger than myself, 2015, ink on vellum, 12 × 9 inches / 30.5 × 22.8 cm. 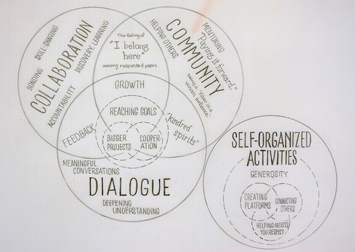 Anonymous response to question 35 on meaning. 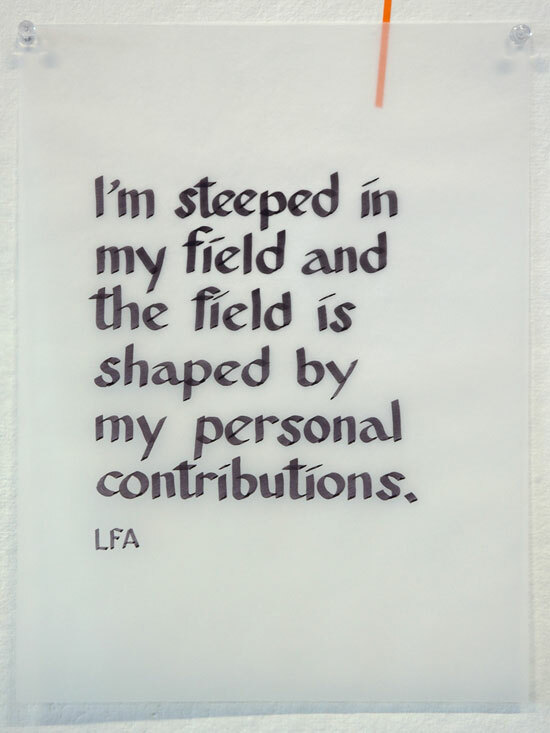 Quote F: Steeped in my field, 2015, ink on vellum, 12 × 9 inches / 30.5 × 22.8 cm. Lauren Frances Adams’s response to question 38 on authenticity. 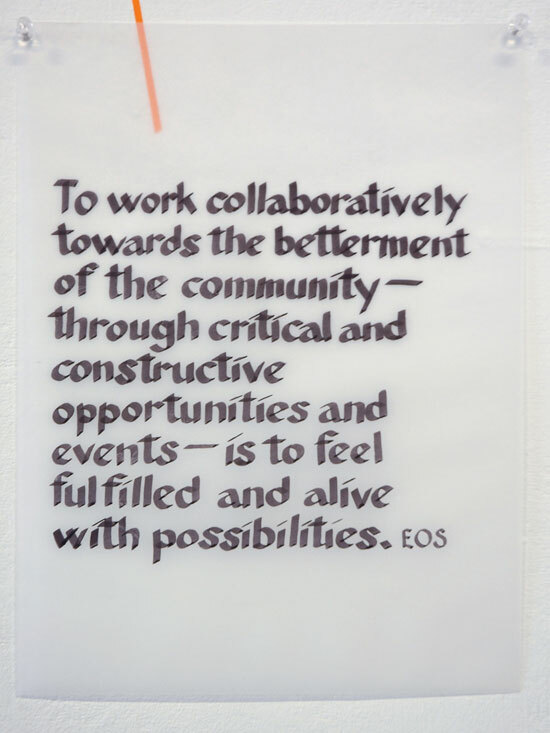 Quote G: To work collaboratively towards the betterment, 2015, ink on vellum, 12 × 9 inches / 30.5 × 22.8 cm. 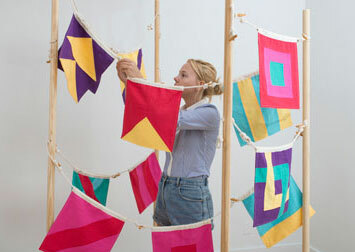 Elin O’Hara Slavick’s response to question 36 on achievement. 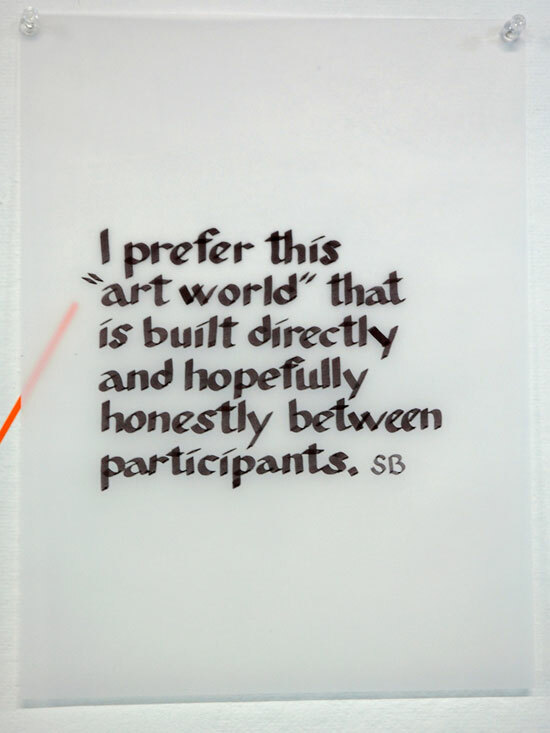 Quote H: Directly and hopefully honestly, 2015, ink on vellum, 12 × 9 inches / 30.5 × 22.8 cm. 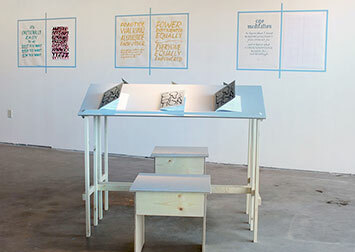 Steven Barich’s response to question 40 on steps towards a more desirable art world. 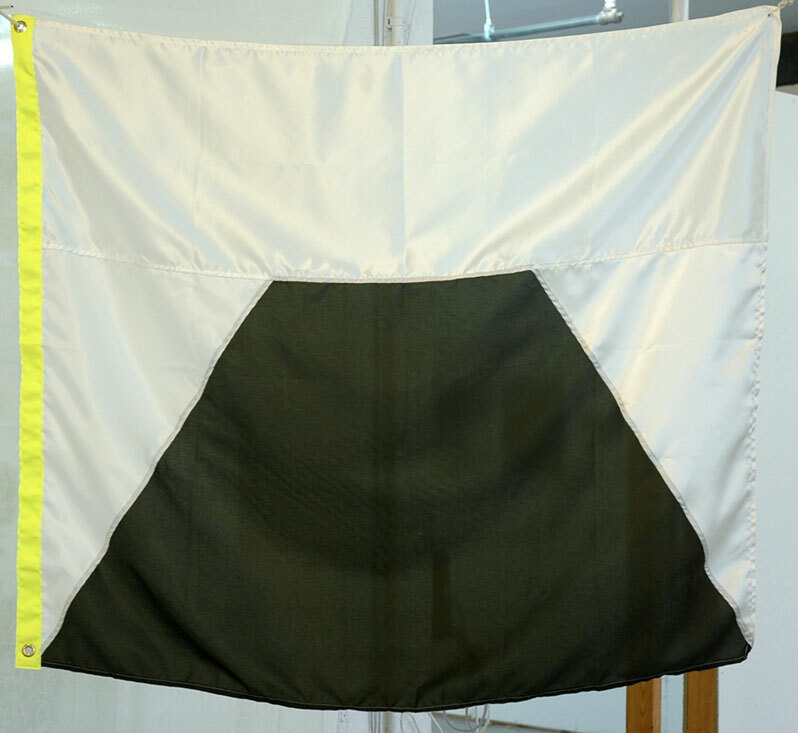 Flag (Inter/dependence), 2015, fabric, 42 × 48 inches / 106.7 × 122 cm. 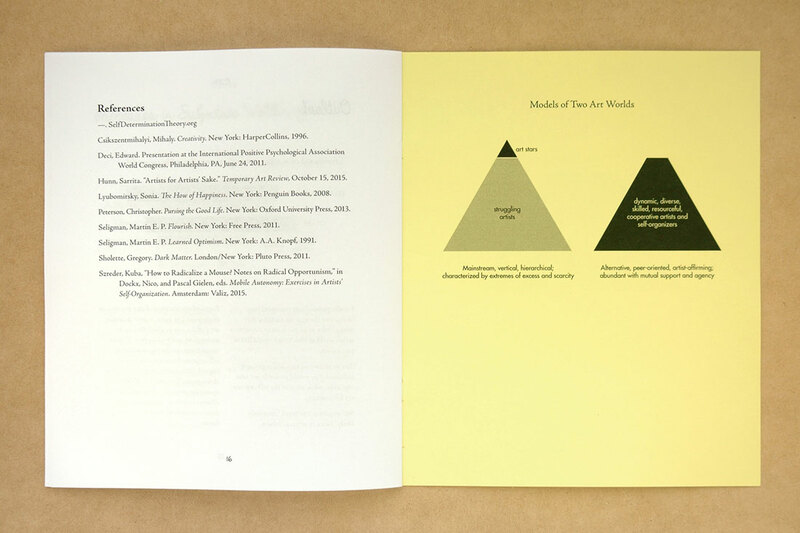 The modified pyramid shape refers to an alternative, peer-oriented model of a more desirable art world. 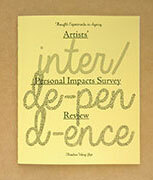 Inter/dependence and these related projects have their origins in the Artists’ Personal Impacts Survey. 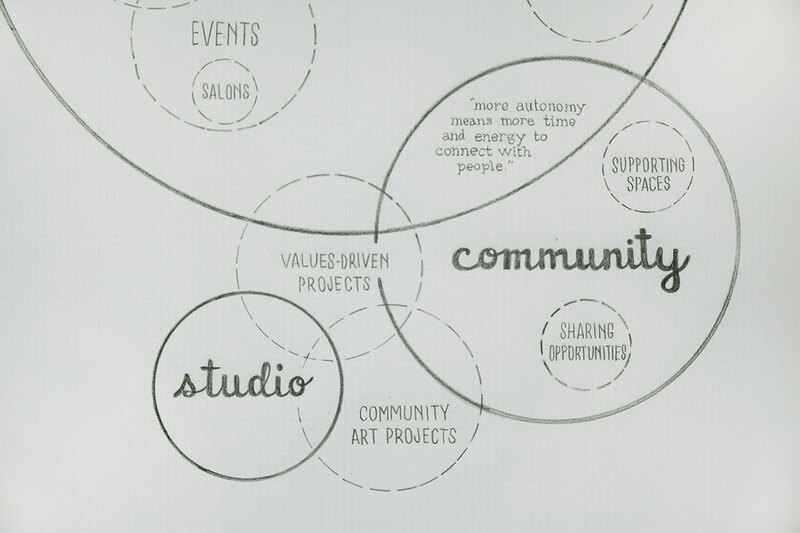 I created and conducted this 40-question survey to explore positive psychological benefits of art practice. 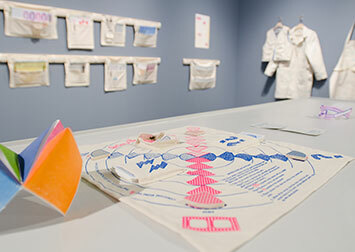 It was completed by 112 visual artists. 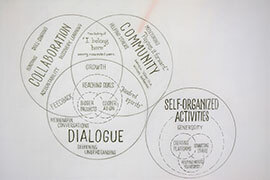 Upon reviewing responses, I noticed respondents’ emphasis on relatedness via connection, community, and collaboration. I also found that a subset of respondents who self-organized activities had stronger opinions, were more active, and were more likely to stay active. I explored these practices in greater detail via follow-up correspondence. These findings are presented in an essay and nine data visualizations in Inter/dependence, a 20-page ’zine. 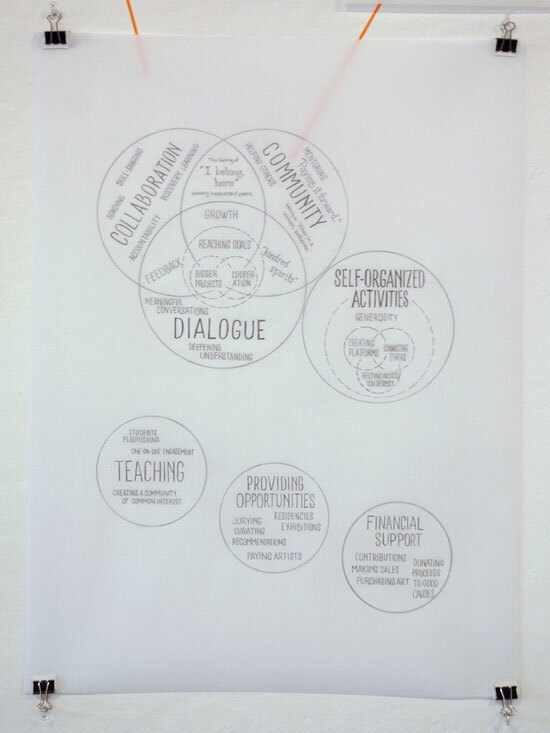 I further summarized the overlaps in the 10 qualitative responses by creating four hand-drawn Venn diagrams. 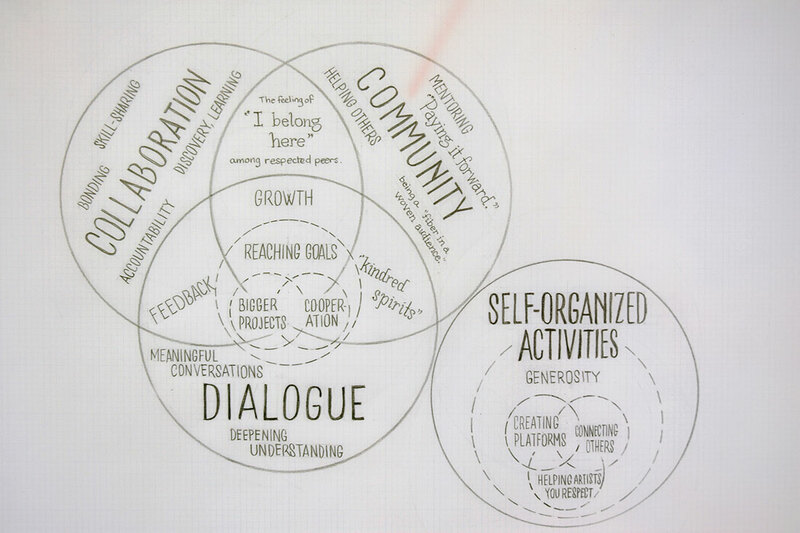 I hand-lettered respondent’s quotes to further explicate the diagrams. 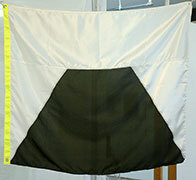 Finally, I sewed a flag to represent how peer artists comprise an art world that I want to participate in. Hardcopies of Inter/dependence are now available via Paypal. Ships via USPS First Class. For orders outside of the US, bulk orders, or wholesale inquiries, please email . 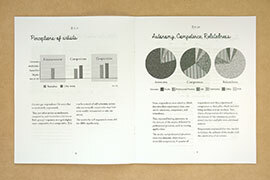 Download the PDF (1.5 MB). 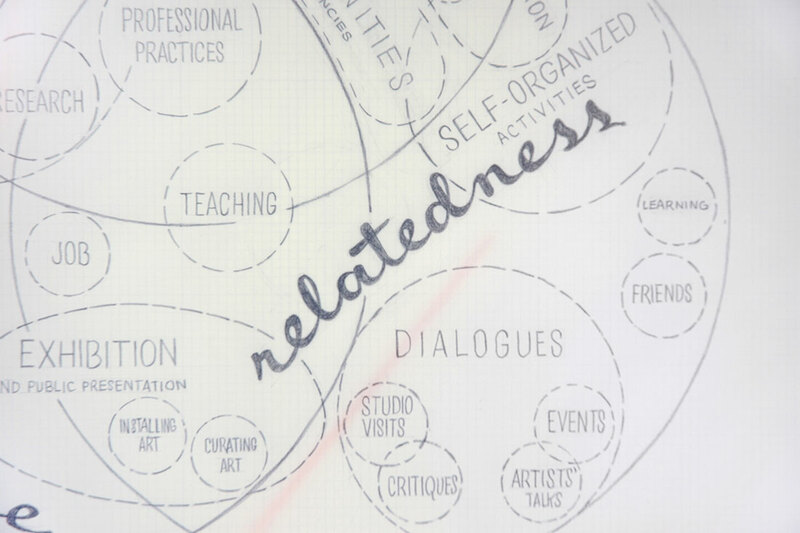 Caption: Christine Wong Yap, Inter/dependence, 2015, mixed media, dimensions variable. 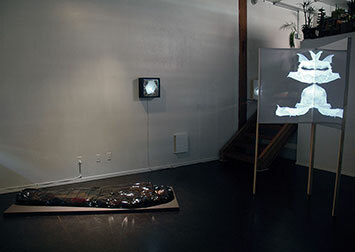 Inter/dependence was developed as part of Lower Manhattan Cultural Council’s Process Space artist residency program in 2015. 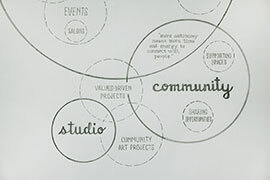 Thanks to all survey respondents, supporters who shared the survey, and LMCC. 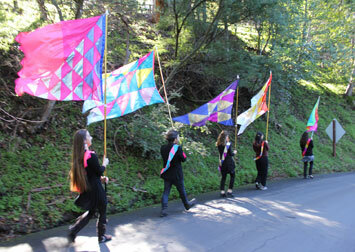 Special thanks to Jocelyn Shu, for survey design input; Stephen Barich, Cal Cullen, Sarrita Hunn, Kate Ann Rhoades, and Weston Teruya for their follow-up correspondence; and Jessie Chaffee, Constantina Zavitsanos, Gregory Gentert, and Tatiana Berg for editing help.